Question #1: Where do you live? All zones of Portland were represented with the most coming from zip codes 97239 and 97219. We even had a runner from Germany! Word travels far and wide. 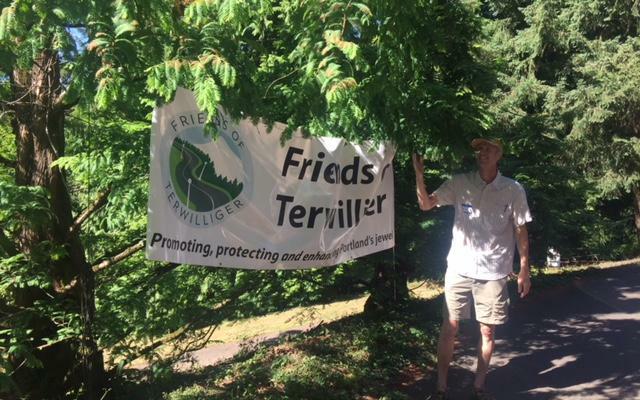 Question #2—What gets you excited about Terwilliger Parkway? What really surprised us was the unsolicited comments from women runners about how safe they felt running alone in the Parkway. Other comments included: a “preserve-type” setting,“park space highlighting livability”; “shady and not busy”;” hills are a good thing for running and training”; “continuous running with few streets to cross”;” restrooms here”;” close to the city”: “love to take the kids here”;” love walking the dog here”. Question #3—What concerns do you have about TP?” Increased traffic”;” need more bathrooms/toilets”; “need more water fountains, especially south of the Chart House”; “being safe as a bike rider-vehicles traveling too fast”; “need more trash cans and doggie poop bags”;” cracks in pavement from tree roots that cause you to trip/fall”; “need to prune blackberries, especially sticking out into the bike lanes”. The overall message was that Parkway users are grateful for FOT’s efforts to preserve and protect this historic place. They’ll be back!